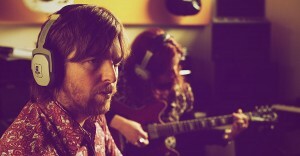 Ashley and I got together to write a second album as ‘the grapes’ in 2009. I’d just returned to Melbourne after ten years in the US and remember feeling a little nervous, wondering if we could still write together. Luckily we took up where we left off and the songs flowed easily, as they had ten years earlier. We compliment each other; I don’t let Ashley get lazy with lyrics and he deals with my arrangement phobias. When I’m stuck on a song he seems to be able to unlock it and finish it. We love the same kinds of music. I’m a little bit country, he’s a little bit rock and roll. We’re both redheads and vegetarians. It all adds up. Working on ideas for songs we noticed common themes emerge. Obviously in the years since making the grapes debut album in 1999 our lives have changed. We are a little older, we have families, and the songs that we’ve written reflect a darker more introspective side influenced by experience. There is still sweetness but not without shadows. Art follows life after all. The songs, with universal themes of lifelong love, separation, loss, pain and longing, evoke characters that could just as easily inhabit West Footscray in 2013 or West Virginia in 1840. 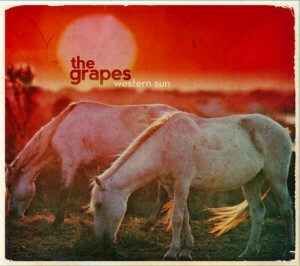 To me ‘Western Sun’ feels like a concept album or the soundtrack to a movie never made. We wrote about the conflicting feelings of parenthood in ‘Make it Out Alive’ and ‘The Boy Who Could Not Sleep’, of child abuse in ‘Mama Why You Hurt Me’, of unrequited love in ‘Step Inside’, and of love enduring a long separation in ‘Ride on Lonely.’ I took a poem by American poet Richard Watson Gilder called ‘The Night Pasture’ and set it to music with Ashley’s guidance. After the eleven songs had been finished we struggled for three years to find the time between our other projects to devote to the grapes. Not for lack of devotion to the project, but simply because life got in the way. We would steal away into the little home studio belonging to our trusty engineer James Bellew and grab an hour here and four hours there to record and mix with every intention of releasing it into the world before 2013. But you just can’t rush the natural course of things and so here we are and it feels like the right time. I hope you are one of those rare breed of music lovers who does still respect ‘the album’ and I hope you enjoy the songs on ‘Western Sun’ as a collection and as a journey that taps into some themes and feelings in your own life. That after all is what a songwriter really aims for. Ride on. The Grapes were born out of a one-off recording session back in 1997 at Seed Studios in South Melbourne. Sherry Rich and I were both signed to Rubber Records when the Australian musical micro-cosmos was at our feet. We recorded a Gene Clark song for a label sampler and that kicked off the idea for a fully fledged Grapes album. The album was recorded for much less than many ‘indie’ video budgets of the day! We did song after song; covers, originals, instrumentals, in Elsternwick, Nashville, St. Kilda, Silverlake, wherever and with whoever was up for a recording session. We had no time constraints. We had a pure mercury river of songs. We had fun!! I learned how to sing confidently in the studio thanks to Sherry. We had a manifesto, Sherry and I would perform all the parts on a Grapes album. One minor concession was having Cal Orr, one of our engineer buddies, playing wine glasses on one song. Aside from that, we did the work. Not flash, but full of love and that ever elusive…vibe. The album came out in ’99 and became a favourite of many of our friends, colleagues and the discerning musical public. We played some shows here and there and toured the East Coast in a sedan. I never tire of the songs, they always sound fresh ’cause we never drove them into the ground. Sherry’s work ethic and our combined will to make it all happen again drove us into a studio space in 2009 and we began piecing together the next chapter. Sporadic recording sessions from 2010 to now have spawned a new Grapes album full of songs about family, loneliness, togetherness, deserts, cities, loss and love and everything else under a western sun.